Find hotel near Sri Vadivazhagiya Nambi P ..
One of the best things to do in Anbil, moreso if you are looking for a spiritual escapade, the Sri Vadivazhagiya Nambi Perumal Temple beckons a visit by everyone who comes to the city. Holding great historic and religious significance, the temple is highly credited by the Hindu folks. As per local folklore, this where Lord Brahma’s unwavering ego was softened by Lord Vishnu. Thus, it is believed that this is where the wrong is corrected affectionately! Create a customized plan for your visit using the Anbil trip planner. You can use ready templates or start from scratch for the same. Generate executable plans on your own or book the top rated Anbil vacation packages for your visit. Read more on how to reach Anbil. Love this? Explore the entire list of places to visit in Anbil before you plan your trip. Fancy a good night's sleep after a tiring day? Check out where to stay in Anbil and book an accommodation of your choice. There are two very important qualities for the Lord – One is Anbu which means immense Love and the Second Azhagu meaning beauty. You can experience both of these in the temple of Sundararaja Perumal Temple in Thiruanbil. 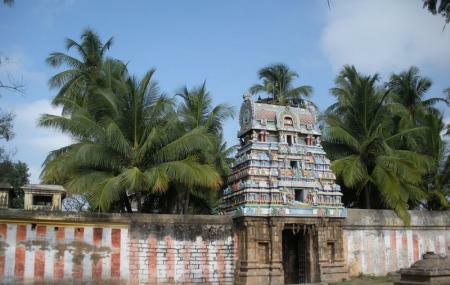 One of the 108 Divya Desams, this temple lies about 25 Kms from Trichy on the banks of Kollidam. The Lord is so beautiful and enchanting. The Moolavar is Sundaraja Perumal aka Vadivazhagiya Nambi Perumal. Thayaar is Sundaravalli Thayaar. Sundararaja Perumal gave darshan to Brahma, the creator and Saint Valmiki in all his splendour and beauty. Lord also relieved Saint Mandookar of the curse of Durvasa. In the Sanctum Sundararaja Perumal gives darshan in a reclining posture over Adisesha with Sridevi Bhoodevi and Brahma. Urchavar is known as Vadivazhagiya Nambi. The Sannadhi of Andal with Utsavar in seated posture is unique to this temple. Devotees seeking marriage perform Poojas to Andal. Sannadhis for Azhwars, Lakshmi Narasimha, Venugopalan and Anjaneyar are also there. The Mangalasasanam of this divine kshetram was done by Thirumazhisaiazwar. The Chozha Kings especially Sundara Chozhan have donated substantially to this temple. Theerthavari takes place during the month of Maasi. Thiru Anbil, or Sundararaja Perumal Temple(also called Vadivazhagiya Nambi Perumal Temple), in Anbil, a village in the outskirts of Tiruchirappalli in the South Indian state of Tamil Nadu, is dedicated to the Hindu god Vishnu. Constructed in the Dravidian style of architecture, the temple is glorified in the Divya Prabandha, the early medieval Tamilcanon of the Azhwar saints from the 6th–9th centuries AD. It is one of the 108 Divyadesamdedicated to Vishnu, who is worshipped as Sundararajan and his consort Lakshmi as Sundaravalli. Thiru Anbil, or Sundararaja Perumal Temple (also called Vadivazhagiya Nambi Perumal Temple), in Anbil, a village in the outskirts of Tiruchirappalli in the South Indian state of Tamil Nadu, is dedicated to the Hindu god Vishnu. Constructed in the Dravidian style of architecture, the temple is glorified in the Divya Prabandha, the early medieval Tamil canon of the Azhwar saints from the 6th–9th centuries AD. It is one of the 108 Divyadesam dedicated to Vishnu, who is worshipped as Sundararajan and his consort Lakshmi as Sundaravalli. The temple is believed to have been built by the Medieval Cholas of the late 8th century AD, with later contributions from Vijayanagar kings and Madurai Nayaks. The copper plate inscriptions from Anbil indicate generous contribution by the Chola kings to the temple. A granite wall surrounds the temple, enclosing all its shrines and bodies of water. The rajagopuram, the temple's gateway tower, is east facing and has a 3-tier structure. The temple is located on the banks of river Kollidam.